Prussia made his way deeper inside the exhibition room, until he reached a cul-de-sac. There stood another bookshelf. He examined the books carefully, some of them are Biology and Chemistry books, some are about Archaeology, and there was a whole section for the Bible. He remembered the book Lithuania gave him earlier. He took it out and put it inside the gap. The book fitted perfectly. Prussia heard a distant screech somewhere, and he decided to check it out. Walking slowly inside the dimly lit room, he found everything has altered somehow. Most of which changed in to a single colour. A little clanging sound was soon heard. The painting next to where Prussia stood, a beautiful painting of a woman among the white lilies eventually changed for the worse. The woman suddenly turned her head slowly, her mouth formed a sinister smile. 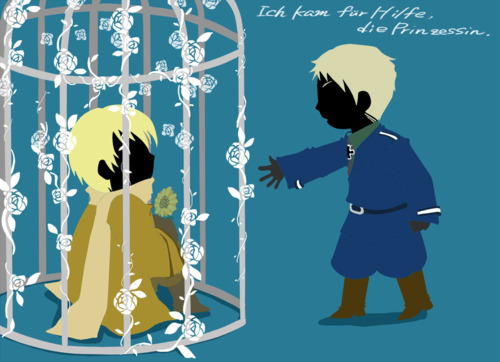 And she suddenly laughed, which made Prussia flinched a little. But that’s not the worst of it. A giant red skull appeared out of nowhere, aimed at him. Prussia was too scared to think. He ran, and ran; quickly made his way around the bookshelf, pass the paintings and glass chambers, and out of the room. He slammed the door shut, then breathed heavily. “That was… close.” Prussia muttered. He slowly opened the door again. The scary-looking skull had somehow disappeared into thin air, and everything returned to their normal state, as if nothing had happened. Prussia advanced into the cold and dark room again. Luckily, the glass chambers are still open. He gently picked up the blue butterfly replica, for fear that he would break the piece in two. He kept it close to his side, and made his way out of the exhibition hall. He then walked into the dark, eerie-smelling storage and made his way towards the giant spider web. He then picked up the poor golden-winged butterfly and replaced it with the replica; after that, he walked out of the room. While he was on the way, the floor made a small crack, but it didn’t bother him much. When he got out of the room, he finally released the butterfly. It flew through the closed door as if it was only an illusion. Prussia heard an unlocking sound somewhere. He then walked back to the library to thank Lithuania. However, the former satellite nation seemed to have hung himself with the very rope Prussia gave him while the albino was gone. His blood dropped slowly on the floor and dirtied the books. He walked out of the small room. He was so sure he heard some tables following his steps, but they didn’t do any harm. He slowly walked to the recently opened door and made his way upstairs. Author Note: I’m terribly sorry if you find this chapter too short. I’ll write something longer next time. Crosses fingers for Gil to get out of the house safe and sound. Uh, no, I’m thinking of posting this on my FB, but it’s limited to my friends only. I played the game before long time ago but I don’t really remember exactly the entire plot. And well. Perhaps Instagram with more tags?